didn't make it out to the barn today, the whole morning was gross and rainy. since my allergies haven't cried uncle yet, i decided to it was best not to go. tomorrow is supposed to be clear, though! Mr. Pawlish has a four day weekend for Labor Day, which is awesome :) we're just going to stay home, relax, and catch up on TV... our favorite way to spend time together! 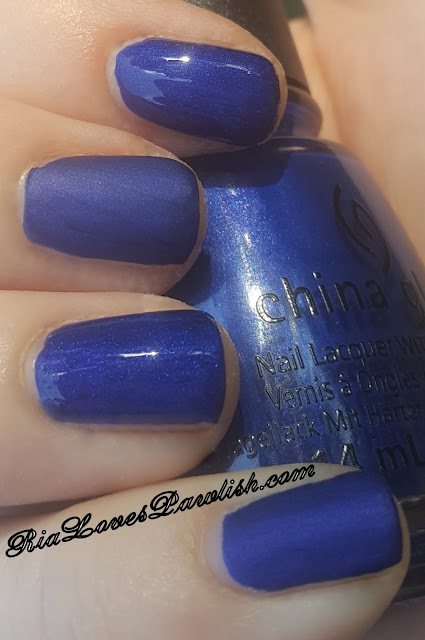 today's China Glaze Rebel collection polish is Combat Blue-TS! (press sample, kindly provided to me for review). it's a rich blue shimmer that dries down to a matte finish... so then you have the sweet options of keeping it matte or making it glossy! it dries pretty quickly as most mattes do, which is really nice. i used two coats, for full opacity... the issue with this is that it dries so fast if you go over the same spot too many times it will peel up. make sure to have enough (but not too much!) on the brush and don't get OCD about it as you apply :) because you can't go over it too much, you may have a few visible brush strokes... but they aren't noticeable in person unless you get up real close. it looks absolutely gorgeous. i love it both matte and glossy... but i wore it glossy as matte chips more easily and i need my nail polish tough since i'm always working with horses. you will need to use two coats of topcoat to get that shininess up because the first coat gets pretty well eat up by the polish! two coats Combat Blue-TS, two coats FingerPaints Fast Dry Top Coat on pointer and ring fingernails. I was so excited to use Combat Blue Ts. All set for color, and my first nail I screwed up by going over the edge. The polish lifted up immediately. Any hints? It's almost impossible to get the edges without a problem. Thanks!